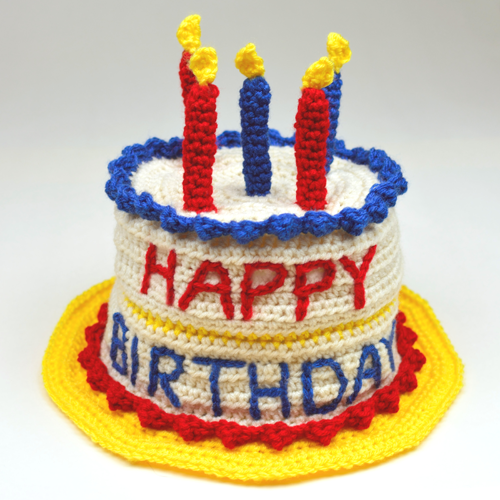 Now 30% OFF in the Crochet Spot Store, the birthday cake hat is big, goofy, and fun to wear! Crochet this hat for someone who’s birthday is coming up. The hat comes in 5 sizes ranging from baby to large adults. Customize the cake to say “Happy Birthday” or any other saying you wish. You can also add the birthday boy or girl’s name to the hat and as many candles as you need. Pattern is already marked down. There is no need for coupon codes. Log in, then add the pattern to your cart and check out. All purchases can be downloaded directly from your account once completed. Offer ends April 12, 2018. This entry was posted on Friday, April 6th, 2018 at 11:25 AM by Rachel Choi	and is filed under News. You can follow any responses to this entry through the RSS 2.0 feed. You can skip to the end and leave a response. Pinging is currently not allowed.